Gary Jones is a poet and freelance writer who lives on the Door Peninsula with his wife of many years. Several of his poems have been published in literary journals, most recently in Pearl, Rosebud, Verse Wisconsin, Nebo, A Summer’s Reading, Museletter, Knock, and the Pulse. 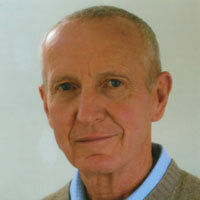 His poetry, along with his short fiction and academic essays, has been recognized in contests. Jones has conducted workshops on writing poetry both for adults and high school students. For workshop information contact him. Poetry that often seizes more than the day. Verse adverse to more than one-night stands. Seduced by their innocence and youth and hope. Pumps iron in the background.